This article discusses post-discharge care for patients following stoma formation. 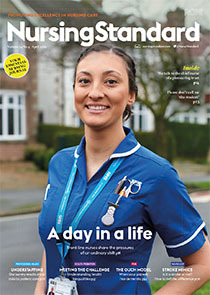 While the patient is taught the practicalities of managing the stoma appliance in hospital, this learning should be integrated into their daily life following discharge from hospital. Nurses are required to consider and address any issues that might affect the patient in the long term. These include changes in body image, adapting to having a stoma, preventing or treating complications associated with a stoma, and long-term follow-up. Most patients manage successfully with their stoma following a period of adaptation. Follow-up for patients with a stoma can occur over the telephone and/or face-to-face in the patient’s home or in the clinic. There are several support groups in the UK that can be accessed by patients with a stoma. Patients should seek advice and assistance from a stoma specialist nurse if any issues related to the stoma arise, such as leakage or sore peristomal skin.